We all know original content is vital for your business blog and it should be published on a weekly basis, but in reality, this can prove to be an extremely difficult and time-consuming task. As a business owner myself, I understand how hard it is to find the time needed for content writing when we have so many other core business activities that need to be taken care of. However, I also know how important a blog with quality content is for driving traffic to my website and generating leads for my business. 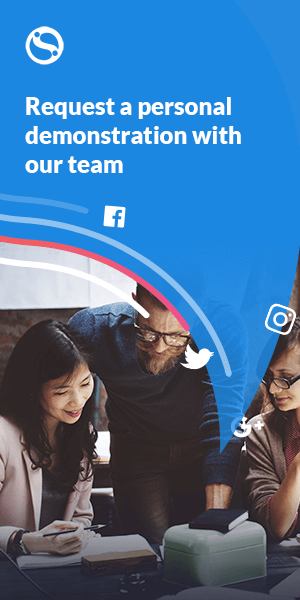 You are already familiar with some of our content features, unique to our social media management platform. You know how to post onto social media, we brought you smart and relevant content curation for sharing and gave you the ability to write your blog articles directly from the compose box to your blog. Now we want to save you more time and bring even more value to your content marketing strategy by helping you with original content creation. 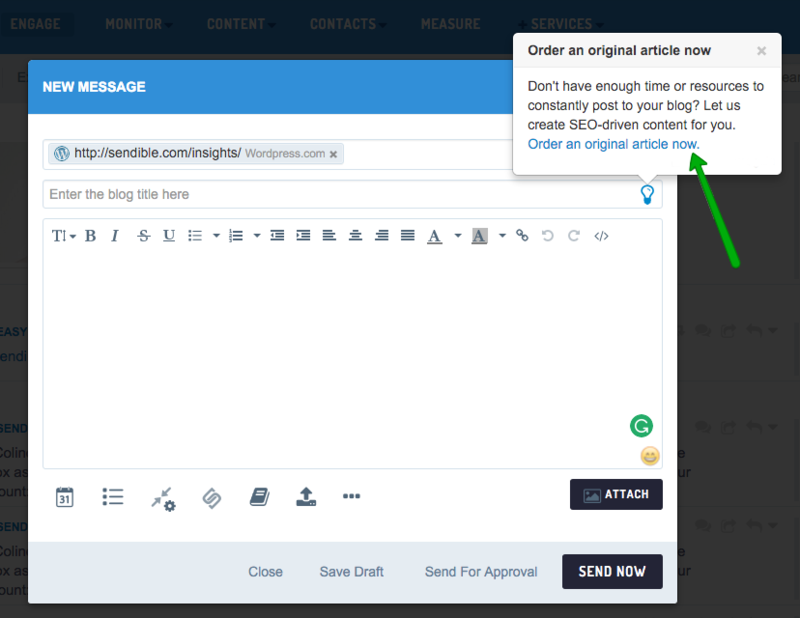 Our SEO Article Creation feature allows business owners to order a steady stream of original, SEO-driven blog articles delivered to your Sendible account, ready to be published to your blog as if you wrote it yourself. For agencies, it adds an additional way to support your clients and provide an even fuller solution to their social media and content needs. Generate additional revenue from existing clients by offering them the option to have customized content delivered to their content libraries. You should be sharing your own unique content on your social channels to drive traffic to your website which in turn, is converted into highly targeted leads for your business. This can only happen when marketers provide a consistent flow of quality content to their readers that can also be found by new readers. We believe so strongly in this strategy that we have developed 3 content creation packages that you can subscribe to, ensuring your monthly content needs are always met. Remember to add your selected SEO keywords to the description to make sure your article is searchable and ready for Google! Not just the back links to your site. 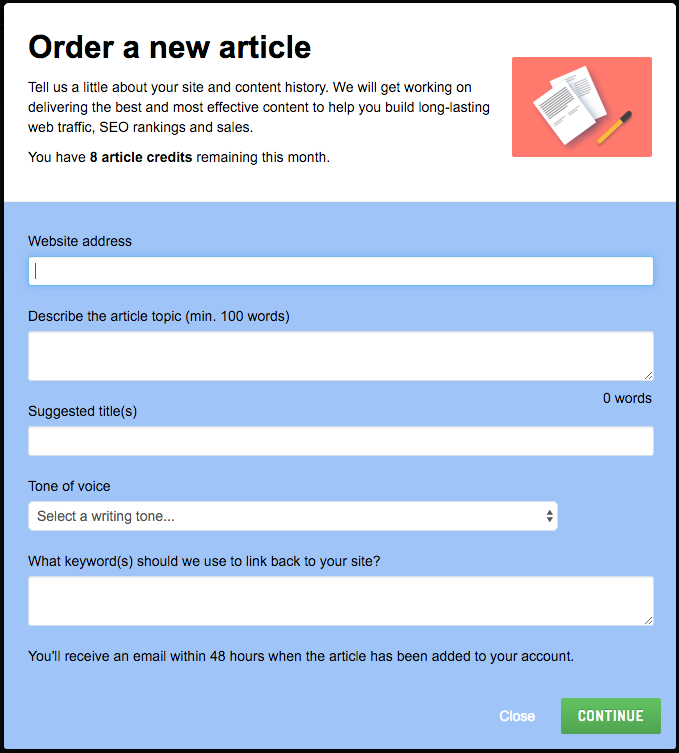 Using the order form, you'll be able to select exactly where you want your content delivered - Drafts, Queues or Content Libraries. Once you have ordered your article, all 500 words and feature image will be delivered directly into your account within 48 hours. So order, sit back and relax or more likely, carry on with all the other marketing tasks you have on your list. If you are thinking what kind of work has been carried out for previous clients recently, here are some of our writer examples with links. What content marketing strategies do you employ at your company? 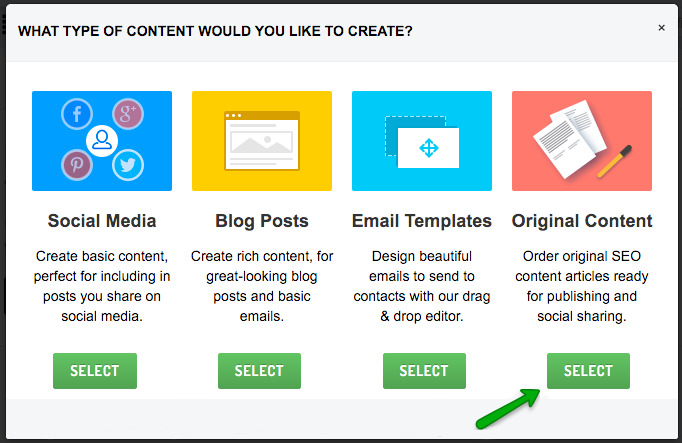 If you're an agency, do you offer clients the option to have original content published to their company blogs? Please do let us know in the comments. We'd also love to hear what you think of this new feature and how it may be useful to your company!